Emanuel Borok is a Russian (many would say American) violinist and teacher born (in Tashkent, Uzbekistan) on July 15, 1944. Although he was Associate Concertmaster of the Boston Symphony for 11 years, he is best known for being the long-time concertmaster of the Dallas Symphony, a post from which he retired in 2010. As a child, he studied violin at the Darzinya Music School in Riga (Latvia) with Voldemar Sturestep. At age 15, he entered the well-known Gnessin Music School in Moscow. One of his teachers there was Michael Garlitsky. After winning some of the top prizes in the All Russian Republic and All Soviet Union Violin Competitions, he joined the Bolshoi Theatre Orchestra as Assistant Concertmaster in 1969. He was 25 years old. 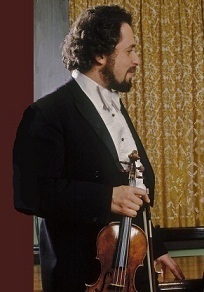 He became Second Concertmaster of the Moscow Philharmonic in 1971. Two years later, he went to Israel to serve as concertmaster of the Israel Chamber Orchestra. In 1974, he came to the U.S. to join the Boston Symphony as Associate Concertmaster, a post which automatically made him concertmaster of the famous Boston Pops Orchestra. In 1985, he joined the Dallas Symphony as concertmaster. He was 41 years old. The Principal conductors under which he was concertmaster were Eduardo Mata, Andrew Litton, and Jaap Van Zweden. Besides concertizing in South America, Canada, and Europe, he has several times partnered in solo appearances with Yehudi Menuhin, Pinchas Zukerman, and Janos Starker, among many others. He continues to perform and teach at several music festivals in the U.S. Borok has taught at the Tanglewood Music Center, the University of Houston, Southern Methodist University, and the University of North Texas. However, he has also occasionally taught in Italy, Switzerland, France, Russia, the Czech Republic, and England. In addition to the dozens of recordings with the Boston and Dallas orchestras, Borok has recorded as a soloist on the Eroica label and has also published cadenzas for the Mozart concertos. A 1727 Stradivarius which Borok played was stolen from him in 1985 in Europe. It was recovered 20 years later before being auctioned off by an unsuspecting auction house. This is unusual because such thefts more than often go unsolved. Erica Morini's stolen violin is still out there somewhere. Borok now plays a 1608 Amati violin which he purchased in 1976. It is definitely one of the oldest violins being played on a concert stage today. You can hear the magnificent (gorgeous) tone of this Amati in this YouTube video. This is violinist profile number 299.